The Quebec Kebs had a great week last week, pulling out a few wins and also getting their first NBL Canada Player of the Week. 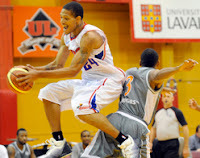 The Kebs guard, Ralphy Holmes, took home this week's honours and is currently the third leading scorer in the NBL Canada averaging 17.3 ppg for the 8-4 Quebec Kebs. Holmes is a deadly shooter and currently the league leader in 3-pt percentage at 53.8%. Not only is Holmes a threat on the offensive end, he also makes his mark on the defensive end, ranking 4th in the league in steals/game (2.0 per game). A little known fact about the Cal State Fullerton alum is that he speaks a little French after having played in France and his French has been put to use playing in Quebec. Holmes and the Kebs have won four straight with a huge help from the Philadelphia native's offensive contribution on the court. Quebec is second in the league standings behind the league leading, London Lightning.